AmeriCommerce is a powerful e-commerce platform designed for high volume online stores. It offers advanced automation, multi-store management, wholesale and retail options, and strong B2B capabilities. 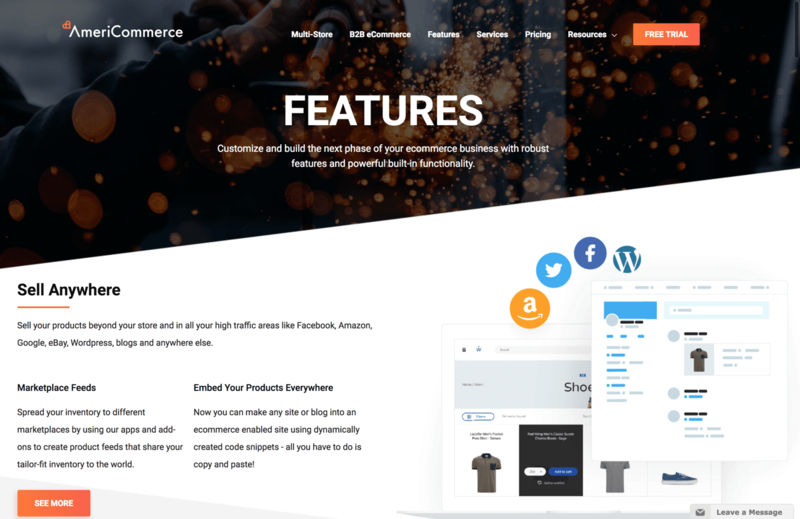 AmeriCommerce offers a powerful and feature-rich e-commerce software platform that will cater to just about any online store, the platform is easy enough for beginners yet powerful enough for experts. AmeriCommerce offers the ability to manage several online stores, which is a real plus for online merchants who do not want to log into multiple accounts. Therefore, if you plan to open more than one online storefront, this e-commerce software platform might be well worth trying. TryAmeriCommerce for free for 14 days, no credit card is required. AmeriCommerce’s cheapest e-commerce software plan is 24.95 per month. This AmeriCommerce review (2019 update) is based on real people’s opinions on Twitter to help you make the best-informed decision before considering buying e-commerce software from AmeriCommerce. AmeriCommerce was originally known as Spark Pay, and was founded by e-commerce and web development veterans Ed Sturrock, Charlie Cooper and Stefan Barlow in 2005. AmeriCommerce has come a long way since its inception. The company is based in Texas and has been around for almost one decade. Today, it hosts over 5,000 sites and processes more than half a billion in sales annually. Founded by Ed Sturrock, Charlie Cooper and Stefan Barlow in 2005. AmeriCommerce is a digital shopping cart application that enables you to create and operate an ecommerce store. The company is based in Texas and has been around for almost one decade. Today, it hosts over 5000 sites and processes more than half a billion in sales annually. So, if you’re looking for a powerful e-commerce platform, AmeriCommerce is likely to make the cut. Find out what it has to offer by reading the following AmeriCommerce review. The AmeriCommerce e-commerce app store is home to 70+ add-ons. The store offers both free and premium extensions. Depending on the added functionality you want your web shop to handle, you can also integrate the AmeriCommerce shopping cart with third-party apps designed for marketing, accounting, inventory control, order management, drop shipping, customer service and more. AmeriCommerce gives online shoppers a variety of ways to pay, be it for downloadable products, subscription services, or physical goods. Frequent buyers have the option of paying for purchases with gift certificates or loyalty reward points earned during repeat purchases. Shoppers will have the option of paying for online purchases with credit and debit cards from major financial service providers such American Express, MasterCard, Visa and Discover too. Moreover, this platform makes it easy to charge for subscriptions or digital products that need to be paid for at recurring intervals. All you need to do is set up a recurring billing account for your customers. Other notable online payment processors that integrate with the AmeriCommerce shopping cart include PayPal, Google Wallet, Google Checkout, and Amazon. This e-commerce platform supports more than 50 payment gateways and the best part is that you can set up multiple payment options for customers simply by using AmeriCommerce’s fuss-free merchant services. The AmeriCommerce shopping cart can be configured to calculate taxes and define whether shipping and handling fees are applicable. It will also integrate seamlessly with accounting systems such as QuickBooks and Peach Tree. With these tools integrated into your web shop, inventory and order reports can be downloaded at the click of a button. A web shop can offer plenty of convenient payment methods, but shoppers will not risk their credit card details on an unsecured network The good news for online merchants is that secure shopping is a guarantee with AmeriCommerce. Customer information remains protected using 128-bit SSL encryption, which is the minimum requirement set by the PCI security standards council. In addition, AmeriCommerce is hosted on secure Rackspace servers, which are equipped with enterprise-quality Cisco firewalls. As far as web design functions are concerned, AmeriCommerce offers an online store builder that’s easy for beginners to use yet powerful enough for experts to customize. You can easily edit your website’s theme with the “Live Design” editor, which offers an intuitive graphical user interface. With AmeriCommerce, you’ll also have full access to HTML and CSS files. This means there are no limitations if you want to alter the layout at the code level. AmeriCommerce’s theme store features dozens of free website templates. The best part about these templates is that most of them are optimized for mobile devices. Therefore, you can design a responsive storefront right out of the box that will perform well on desktops, tablets, and smartphones without hiring a professional web developer. Launching a new webshop with AmeriCommerce is quite convenient since the company provides domain name registration (this comes with an extra cost, though). What’s more, this e-commerce platform allows you to create multiple stores from the same backend. When it comes to marketing, AmeriCommerce supports most of the channels you need to promote your online store. For instance, you can take advantage of content marketing using the built-in blogging function. With full control over metadata and URLs, you’ll be able to handle on-page SEO for every new blog post. In addition, this e-commerce tool generates XML sitemaps, allowing search engines crawlers to access your web shop pages with ease. Thanks to integrations with email marketing add-ons such as Mail Chimp, Constant Contact, iContact, and Aweber, AmeriCommerce lets you send newsletters and targeted email messages to customers on your mailing list. Product feed integration is another nifty marketing feature that this e-commerce software offers. It allows you to increase exposure amongst savvy shoppers by distributing dozens of product listings across other shopping sites such as Amazon, Yahoo, ShopZilla, NewEgg, and many more. Once customers start buying your orders, the loyalty reward points program can help to drive repeat purchases. It’s possible to enable your AmeriCommerce shopping cart to prompt for customer feedback. This marketing tool can be quite powerful if you’re offering a quality service or product. Once satisfied shoppers leave positive testimonials, this might just compel prospective buyers to trust in your brand. Need to manage multiple stores? You can do it easily from a single interface, using shared inventory, with Americommerce. AmeriCommerce was designed with comprehensive inventory management functions. Whether it’s updating stock counts or adding new products, everything can be handled from the admin panel. Your product listings may include videos, text descriptions, and multiple images. AmeriCommerce uses intelligent technology to keep track of inventory counts in real time. On top of that, regular customers can opt-in for product notifications that let them know when an item is in or out of stock. Currently, AmeriCommerce does not offer live chat support. However, you can talk to a support rep via phone when in need of urgent technical assistance. AmeriCommerce operates two numbers: one for online store support and another one for assisting customers with mobile payment issues. For general questions, you can contact the sales team via email. AmeriCommerce has a growing online knowledge center with plenty of video tutorials and help articles. The company’s extensive online help resources can provide answers to frequently asked questions and other non-urgent inquiries. » Multiple storefront support allows you to operate more than one webshop from a single backend. » Robust marketing and store management features. » 14-day trial with no billing information required. » Responsive templates and themes. » Free shared SSL certificate across all plans. » If allocated bandwidth and storage space are exceeded, you will incur extra fees. » Storage space is rather limited with lower tier plans. » No live chat support is being provided as of writing this review. Any tool that solves problems and maximizes efficiency is a coveted resource in the business world. AmeriCommerce offers the ability to manage several online stores, which is a real plus for online merchants who do not want to log into multiple accounts. Therefore, if you plan to open more than one online storefront, this e-commerce software platform might be well worth trying. If you are still on the fence, then take advantage of AmeriCommerce’s 14-day free trial. AmeriCommerce has a range of well laid out and simple priced e-commerce software plans for getting your online store up and running. For latest and most up to date prices visit AmeriCommerce’s website. Try AmeriCommerce. Free 14-day trial. No fees, no credit card required. Next: OpenCart Review: E-Commerce Shopping Cart. But is it the best for your business?